Product listing ads continue to drive growth with added exposure on mobile and search partners. If there’s one theme to be taken from Merkle’s Q1 Digital Marketing Report, it’s that Google is miles ahead of Bing and Yahoo in driving and monetizing mobile search traffic. 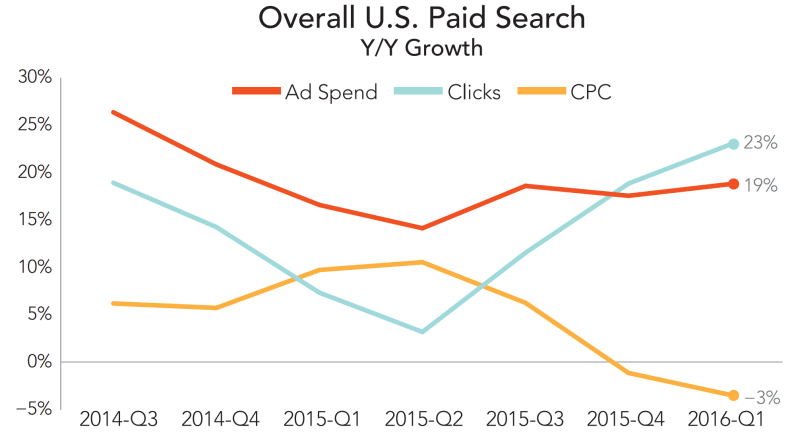 Driven almost entirely by Google, mobile paid search continues to grow, with smartphone click share rising from 33 percent in Q4 2015 to 39 percent in Q1 2016 overall. On Google, 57 percent of paid search clicks came from mobile in Q1. Overall, desktop paid search clicks were flat and tablet clicks were off five percent year over year, compared to 101-percent growth for smartphone clicks. Google paid search saw solid growth in Q1 among Merkle’s client base, with spend rising 25 percent year over year as click volume increased 33 percent. Overall, CPCs fell six percent as mobile click share continued to rise. Non-brand search ad clicks grew 42 percent, and spend on non-brand keywords rose 24 percent, the highest growth rate seen in six quarters. Combined spend across Bing Ads and Yahoo Gemini fell 10 percent year over year. Clicks were off 14 percent, though CPCs rose four percent. Among Merkle’s client base, 95 percent of all paid search clicks that came from phones were generated by Google in Q1, up from 86 percent a year ago. Bing Ads held 19 percent of desktop clicks, 13 percent of tablet clicks and just three percent of all US smartphone clicks. Yahoo Gemini generated three percent of all desktop and tablet ad clicks and just one percent of all smartphone ad clicks. Merkle’s customer base skews large US retailer, which makes these quarterly reports something of a bellwether of PLA trends in the US. In Q1, PLA spend rose 41 percent year over year compared to 13 percent growth from text ads. PLAs accounted for 43 percent of Merkle’s retail clients’ overall search ad clicks from Google and a whopping 70 percent of non-brand clicks. PLAs are generating a greater share of clicks for larger retailers than smaller, but the median retailer generated 37 percent of overall Google clicks from PLAs. Clicks from search partners (which include third-party retail sites and, somewhat oddly, Google image search) rose 545 percent year over year and contributed six percent of the total PLA click growth. In contrast to Google’s ongoing ability to monetize PLAs from mobile and search partners, Bing saw spending growth from Product Ads slow to just 21 percent in Q1, down from 98 percent a year ago. Non-brand clicks across both engines fell 12 percent in Q1 as spend on non-brand keywords fell 10 percent. Non-brand CPCs rose two percent. Yahoo Gemini’s share of combined clicks across Bing and Yahoo has held relatively steady since August 2015, when it pushed migration from Bing Ads. In Q1, Gemini’s click share was just under 17 percent. Merkle says there has been relatively little impact on both paid and organic trends from Google’s most substantial paid search change of Q1, namely removing text ads from the right rail on desktop. However, PLAs appear to have received a slight boost in click volume, as Google seems to be showing PLAs in the mainline with greater frequency, and there is less visual competition when they appear in the right rail.